Hokkaido is now officially linked to the capital of Japan via a Shinkansen. Right on schedule as I blogged about last year. The Hokkaido Shinkansen Line, which runs between Shin-Aomori and Shin-Hakodate-Hokuto, Hokkaido, and slices the travel time from Tokyo to Hokkaido by 53 minutes, is now in operation. According to operators Hokkaido Railway Co. and East Japan Railway Co., the high-speed trains running on their two lines between Shin-Hakodate-Hokuto and the capital will take as little as four hours and two minutes. 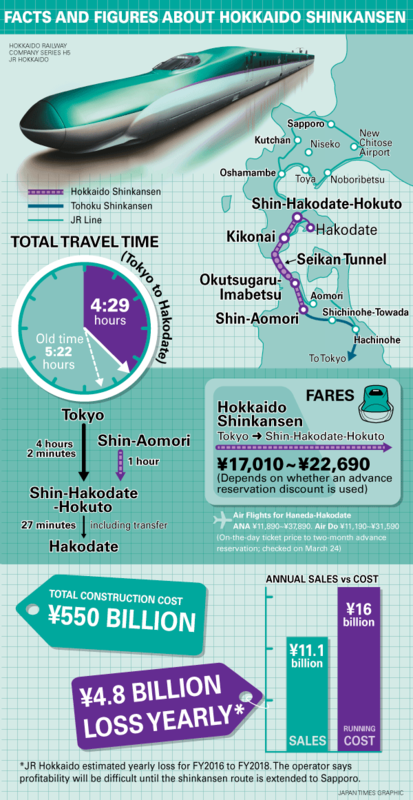 The Infographic below by the Japan Times illustrates the awesomeness of the new Hokkaido Shinkansen well.